Background fabric: Floral Burst in Purple from Biology by Sarah Watson for Cloud9 Fabrics. 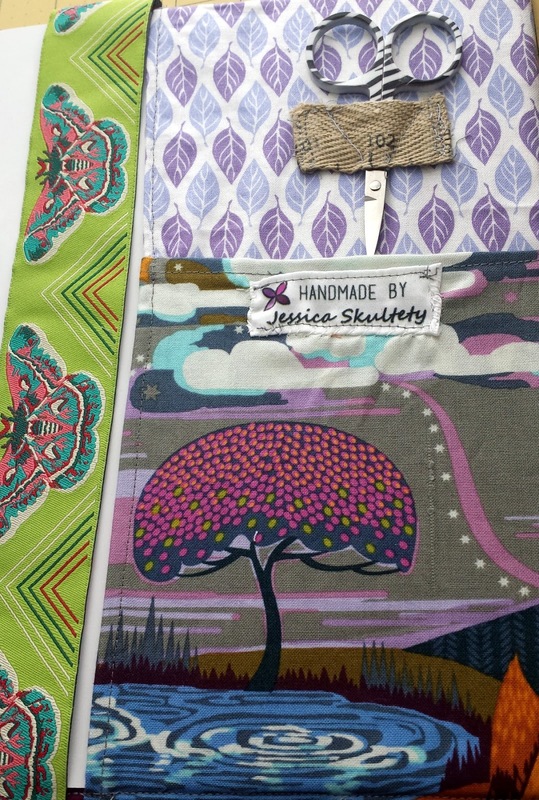 Orange peel fabric: Flight from Waterfront Park by Violet Craft for Michael Miller Fabrics. Zipper tabs: Lizzy House jewels. Making a list is always helpful until the lists take over my desk. :) This is why I like having one place to keep all my thoughts for the week/month - a planner. 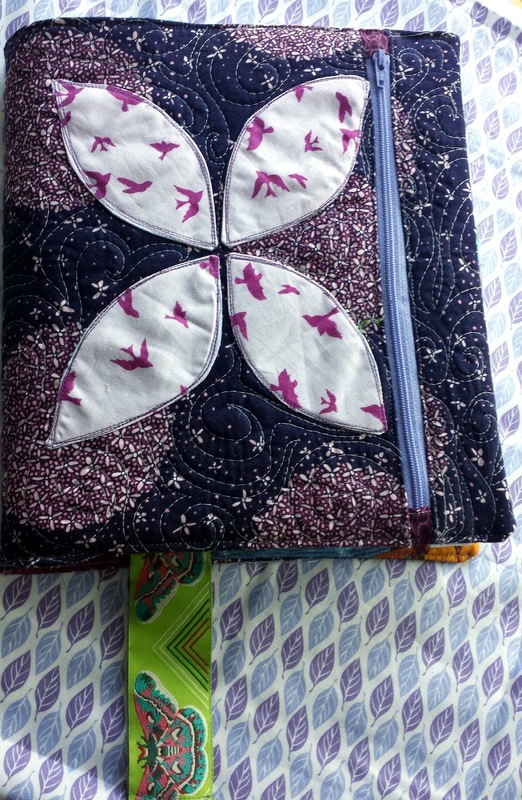 The zippy notebook cover is a pattern originally by Amanda @whatthebobbin and re-engineered for the Quilter's Planner by Amanda and Stephanie @latenightquilter. 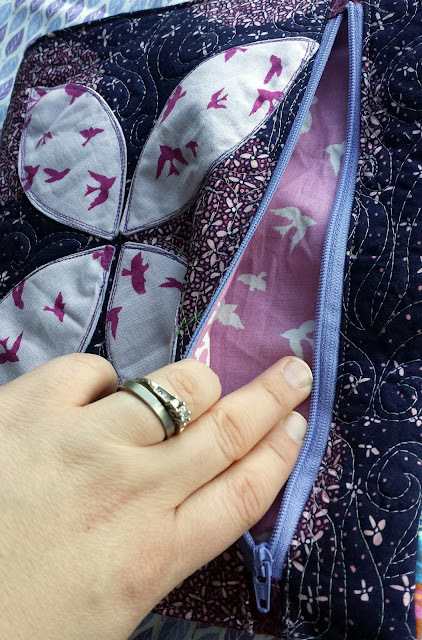 The pattern was easy to follow, except I got a little lost in the zipper tabs section (but I used this method from Renee @quiltsnfeathers and it worked out just fine). The front pocket came out so professional and pretty (though a little wrinkly somehow - I did press, I swear!). I am going to throw my business cards into one of the pockets (I don't envision having use for so many pockets anyway, but they're nice to have). I LOVE how there is room for a bookmark! I specifically sought out some ribbon I received from Anna Maria Horner's store last year. Also, a place for scissors, using measuring tape ribbon from Target I've been hoarding. Also, one of my new labels, which really isn't quite so wonky in real life! Eek! Look whose block is featured in September? I wrote the tutorial for this block (which, alternatively looks like a spool) as part of the Fabri-quilt Blog Hop this past summer. You can see the free tutorial here and all the weekly blocks featured in the planner right here. Thanks to Stephanie for an AMAZING Quilter's Planner. I love the space for tracking WIPs, brainstorming new ideas (especially helpful with planning blog posts so far), listing swaps, and setting personal and quilty goals. It's perfect! Time to start planning. Hehe. My favorite. This cover is so you! I love all the fabrics you chose. I want to see the insides of the everyone's planner to see what people are doing with it. I don't feel like I'm utilizing mine very well yet and want to get ideas from everyone else! That's so awesome! 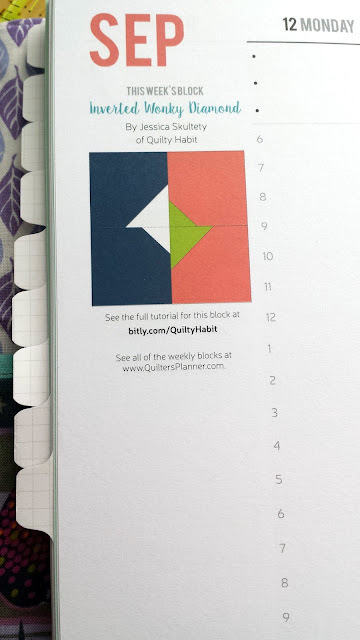 I love planners too and couldn't function without mine (just a normal one, though the quilter's one looks great). The ribbon is beautiful! Love your planner. I should make one of those. The cover is cool. Lucky you, I'm still waiting for my planner to arrive.🙁 Your cover looks great. Is there a link to the reworked cover pattern? I would love to make one, too! Hi Michelle! I was unable find your email to reply to you. There is and it comes with purchase of a planner. You should receive an email! I see the planners have sold out. Will there be a wait list or the ability to order and receive when available? I knew I should have ordered when I first saw it! You can email Stephanie at latenightquilter@gmail.com - she created them and she will have info as to where you might be able to order. Thanks! Thank you and by the way, your blog is one of my absolute favs. Thank you for sharing the amazing work you do. I love the quilt you made for you dad! I like the concept of that planner. Fun! Great looking cover, I love the design. I need to make one for mine soon. I love your cover! 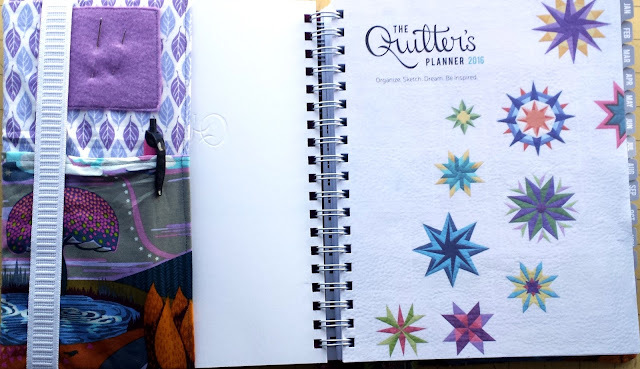 and I am so glad you enjoy The Quilter's Planner! It was a nice surprise to see this post after I popped on over to your page after reading about your profile at WhileSheNaps.com. I'm signing up for your newsletter now. Can't wait!